i use Cura 3.1 for testing. I came from S3D. A question i can't find a answer, how can i manipulate the infill on one object for different part sizes? What i mean as example, i have a big cube and a small cylinder on top of the cube. If i set the infill to 30% it is fine for the cube, but the cylinder has no infill than. 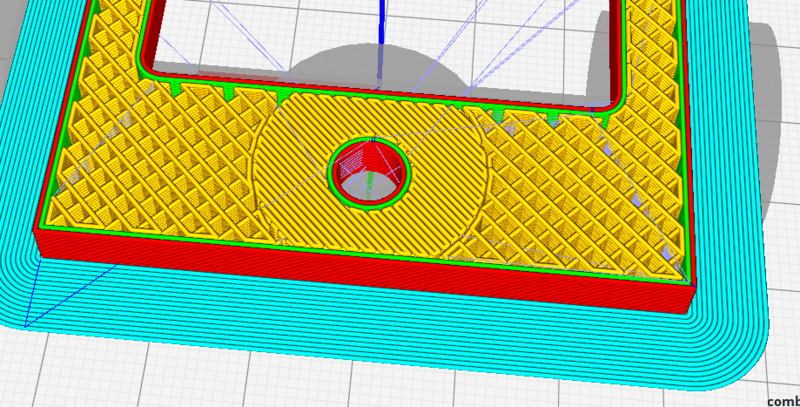 In S3D i can make different settings for different heights, but i cant find something like that in Cura. I saw the gradual infill option, but i don't helps. Maybe it would be possible, to have a option, the infill is calculated from the volume of at a layer height? 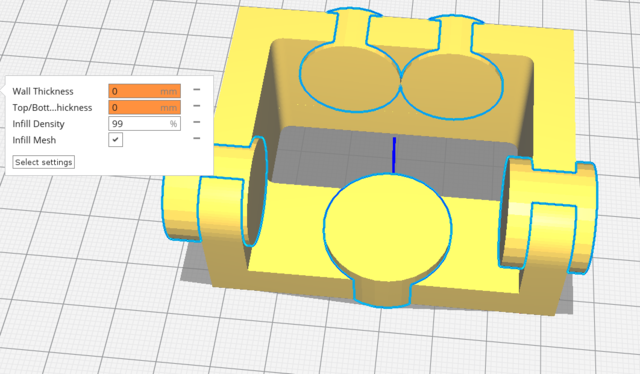 In the current stable version of Cura, you can select a model and then go to 'per model settings' on the left side tool bar. It is the icon that looks like 3 hourglass type of shapes. There you can choose almost all settings to apply individually. Yes i know this. But i meant in one model. Split that model into parts. Put Cura in "custom mode"
The cube now turns transparent gray. Position the cube to overlap part of your model. It should overlap with the section that you want to change the infill for. Also with "per object settings" select the option "infill density"
The picture shows a cube on the buildplate with infill 20%. Locally, with a rotated 2nd cube, the infill % is raised to 100%. What happens is that the volume where the cube intersects with your object is locally sliced with different infill. I had no idea that could be done. Thanks! I think you showed that before, but I mistook it for different parts having different wall and infill by being part of the model. I did not realize you had done what I now understand. Thanks for showing this again. Thanks for the tutorial tomnagel! I was just able to use this method to solve an issue I had been having with a certain print. I was able to create a hollow in the model to fill in during printing for weight and still keep the main model in strong, good pieces.